Lorry Drivers’ daily walkaround check can help reduce road accidents. Very few organisations operate without using the road. Millions of vehicles - lorries, vans, taxis, buses, emergency service vehicles, company cars, motorcycles, bicycles - are used for work purposes, and many people work on foot on or by the road - maintenance workers, refuse collectors, postal workers, vehicle breakdown employees, the police and so on. All these workers are exposed to risks from traffic. It is estimated that between one quarter and one third of reported road casualties occur in road accidents involving someone who was driving, riding or otherwise using the road for work purposes. The number of work-related road casualties has fallen substantially in recent years, because all road casualties have fallen substantially. However, the proportion of all road casualties that are work-related has not changed. Between 2006 and 2016, almost 30% of road deaths and 22% of serious casualties occurred in accidents involving at least one at-work driver or rider. In December 2014, the Glasgow bin lorry tragedy left six dead and another fifteen injured when a 26-tonne refuse vehicle ploughed into pedestrians after mounting the pavement. Fortunately, this type of accident gets huge media attention because they are relatively infrequent; and just like other drivers, lorry drivers can be involved in accidents that are no fault of their own. 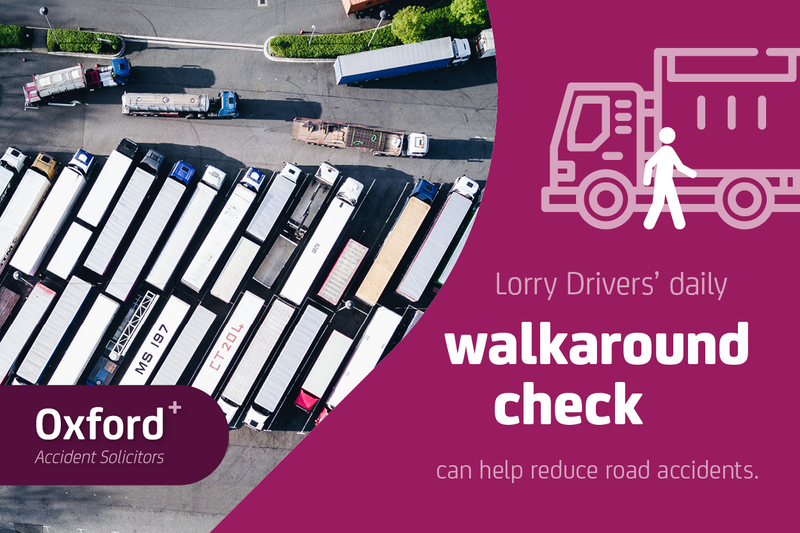 One way that HGV drivers can reduce the risk of accidents is to carry out the daily walkaround check to make sure their vehicle is safe to drive, calculated to take about 15 minutes. Here is the complete checklist as issued by the government’s Driver and Vehicle Standards Agency. If you are the victim of an accident involving an HGV vehicle through no fault of your own, you may be entitled to compensation. Please contact Oxford Accident Solicitors on 01865 315309 for a FREE consultation.